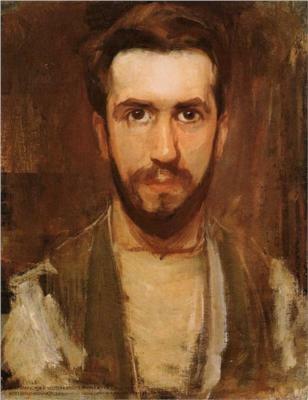 An influential non-representational painter, Piet Mondrian’s art evolved over his lifetime into his own unique style, which he coined “neo-plasticism.” This art was not based on outside artistic influences or on typical techniques, but was instead Mondrian’s interpretation of his deeply felt philosophical beliefs. He subscribed to two sets of philosophical beliefs; theosophy, a religious mysticism which sought to help humanity achieve perfection, and anthroposophy, which held that the spiritual world was directly accessible through the development of the inner self. His works were thus aimed at helping humanity through aesthetic beauty and breaking from a representational form of painting. He published his explanation of neo-plasticism in his art publication De Stijl (The Style) in 1917 and 1918. Although his early work was representational, he slowly developed his artistic philosophy, his works slowly devolving first into cubism, then to pure abstraction and non-representation. After WWI, he flourished in the post-war atmosphere of Paris, which allowed him pure creative freedom. Upon the outbreak of WWII, and the approach of fascism, he moved to Manhattan, NY, where he spent the rest of his life. It was in his Manhattan studio where he felt most creative, and in which he created his great masterpieces. 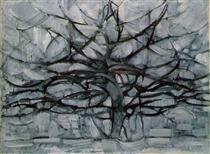 Mondrian was an avid painter, and would paint until his hands blistered. Sometimes he made himself sick, and others he made himself cry from exhaustion. While in his Manhattan apartment, he rearranged large colored panels on his walls, and painted other portions, rearranging and moving the panels as he completed his canvas paintings, or as he completed periods of painting. He later said that his ever-changing surroundings in his Manhattan studio was the best space he ever inhabited. After his death, his friend Harry Holtzman carefully measured each of the panels on Mondrian’s walls and turned them into a traveling exhibition called Wall Works. 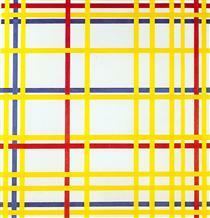 Today, Piet Mondrian’s legacy lives on in the fashions of Yves Saint Laurent, and the L’Oreal make-up line. Pieter Cornelis "Piet" Mondriaan, after 1906 Mondrian (/ˈmɔːndriˌɑːn, ˈmɒn-/; Dutch: [ˈpit ˈmɔndrijaːn], later [ˈmɔndrijɑn]; 7 March 1872 – 1 February 1944), was a Dutch painter and theoretician who is regarded as one of the greatest artists of the 20th century. He is known for being one of the pioneers of 20th century abstract art, as he changed his artistic direction from figurative painting to an increasingly abstract style, until he reached a point where his artistic vocabulary was reduced to simple geometric elements. 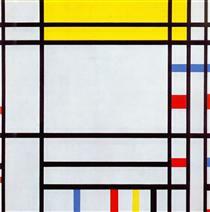 Mondrian's art was highly utopian and was concerned with a search for universal values and aesthetics. He proclaimed in 1914: Art is higher than reality and has no direct relation to reality. To approach the spiritual in art, one will make as little use as possible of reality, because reality is opposed to the spiritual. We find ourselves in the presence of an abstract art. Art should be above reality, otherwise it would have no value for man. His art, however, always remained rooted in nature. 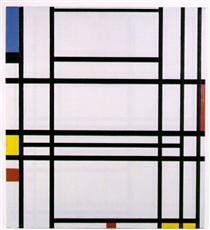 He was a contributor to the De Stijl art movement and group, which he co-founded with Theo van Doesburg. He evolved a non-representational form which he termed Neoplasticism. This was the new 'pure plastic art' which he believed was necessary in order to create 'universal beauty'. To express this, Mondrian eventually decided to limit his formal vocabulary to the three primary colors (red, blue and yellow), the three primary values (black, white and gray) and the two primary directions (horizontal and vertical). 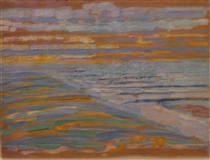 Mondrian's arrival in Paris from the Netherlands in 1911 marked the beginning of a period of profound change. He encountered experiments in Cubism and with the intent of integrating himself within the Parisian avant-garde removed an 'a' from the Dutch spelling of his name (Mondriaan). Mondrian's work had an enormous influence on 20th century art, influencing not only the course of abstract painting and numerous major styles and art movements (e.g. Color Field painting, Abstract Expressionism and Minimalism), but also fields outside the domain of painting, such as design, architecture and fashion. Design historian Stephen Bayley said: 'Mondrian has come to mean Modernism. His name and his work sum up the High Modernist ideal. I don’t like the word ‘iconic’, so let’s say that he’s become totemic – a totem for everything Modernism set out to be. 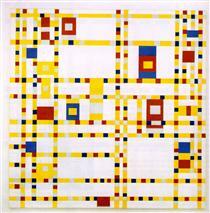 Mondrian was born in Amersfoort in the Netherlands, the second of his parents' children. He was descended from Christian Dirkzoon Monderyan who lived in The Hague as early as 1670. The family moved to Winterswijk when his father, Pieter Cornelius Mondriaan, was appointed head teacher at a local primary school. Mondrian was introduced to art from an early age. His father was a qualified drawing teacher, and, with his uncle, Fritz Mondriaan (a pupil of Willem Maris of the Hague School of artists), the younger Piet often painted and drew along the river Gein. 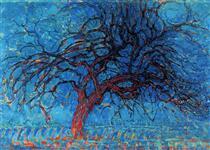 After a strict Protestant upbringing, in 1892, Mondrian entered the Academy for Fine Art in Amsterdam. He was already qualified as a teacher. He began his career as a teacher in primary education, but he also practiced painting. Most of his work from this period is naturalistic or Impressionistic, consisting largely of landscapes. These pastoral images of his native country depict windmills, fields, and rivers, initially in the Dutch Impressionist manner of the Hague School and then in a variety of styles and techniques that attest to his search for a personal style. These paintings are representational, and they illustrate the influence that various artistic movements had on Mondrian, including pointillism and the vivid colors of Fauvism.